COMING SOON! Codeine Phosphate tablets belong to a group of medicines called analgesics and are used for pain relief. Codeine Phosphate tablets belong to a group of medicines called analgesics and are used for the relief of mild to moderate pain and symptoms of a dry cough or diarrhoea. symptoms of a dry cough or diarrhoea. Do not take Codeine Phosphate tablets during pregnancy or whilst breast-feeding, unless advised by your doctor. Regular use during pregnancy may cause withdrawal symptoms in the newborn. Usually it is safe to take Codeine Phosphate tablets while breast feeding as the levels of the active ingredients of this medicine in breast milk are too low to cause your baby any problems. However, some women who are at increased risk of developing side effects at any dose may have higher levels in their breast milk. If any of the following side effects develop in you or your baby, stop taking this medicine and seek immediate medical advice; feeling sick, vomiting, constipation, decreased or lack of appetite, feeling tired or sleeping for longer than normal, and shallow or slow breathing. Always take Codeine Phosphate tablets exactly as your doctor has told you. If you are not sure, check with your doctor or pharmacist. Do not drink alcohol whilst taking Codeine Phosphate tablets. 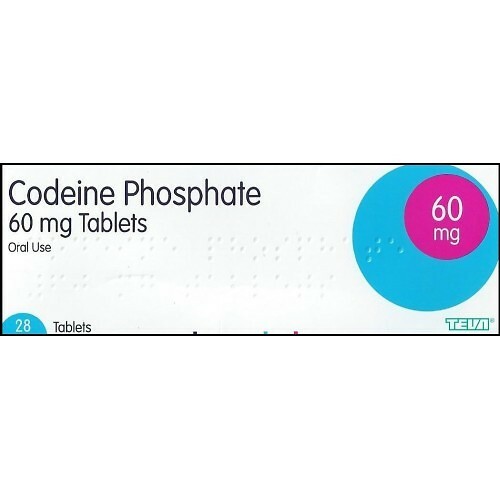 Codeine Phosphate tablets are normally used only for short-term relief of symptoms, take this medicine for as long as your doctor tells you to, it may be dangerous to stop without their advice. For pain relief – 30 - 60mg every four hours up to a maximum of 240mg a day. For diarrhoea – 15 - 60mg three to four times a day. Elderly with liver or kidney damage: your doctor may give you a smaller dose. If you are elderly, it is particularly important to take this medicine exactly as directed by the doctor. If you (or someone else) swallow a lot of tablets at the same time, or you think a child may have swallowed any contact your nearest hospital casualty department or tell your doctor immediately. Symptoms of an overdose include feeling or being sick, drowsiness, tiredness, low blood pressure, pinpoint pupils, slow breathing rate, fast heart rate.